WASHINGTON — The F-35 joint strike fighter will fly until 2070, reflecting a decision by the US armed services to extend the operational life of the fleet by six years. All three services that operate the F-35 — the US Air Force, US Navy and US Marine Corps — increased the total flight hours for the fleet by 1.6 million, F-35 Joint Program Office Chief Lt. Gen. Christopher Bogdan told reporters March 24 at the Pentagon. Of the total, the Air Force added 1.3 million flight hours, while the Navy added 300,000 flight hours, according to the JPO. The Air Force extended the life of each F-35A jet by two years, adding six years in total to the program, according to the JPO. This effectively means the JSF will fly until 2070, instead of 2064 as planned. This extension translated into an addition of $45 billion in operating and support (O&S) costs to the 2015 estimate, masking a 2 to 4 percent drop in real O&S costs, Bogdan stressed. Without this extension, F-35 life cycle O&S costs would have decreased by about $22 billion from the 2014 estimate, he said. From 2014 to 2015, O&S costs saw a net increase of $23 billion from $597.8 billion to $620.8 billion. The Pentagon’s latest Selected Acquisition Report shows the estimate for procuring the F-35 over the life of the program decreased from $391 billion in 2014 to $379 billion in then-year dollars, a drop of $12.1 billion, according to a summary of the report sent out by the Pentagon March 24. Not counting inflation, this translates into a $7.5 billion drop in base-year 2012 dollars, Bogdan said. The SAR reflects the program’s total acquisition cost in then-year dollars, while the JPO generally uses base-year 2012 dollars in order to compare apples to apples. 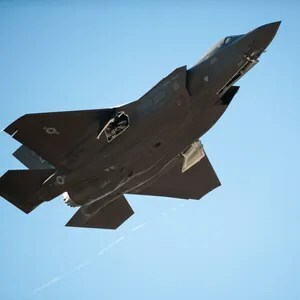 Compared to the 2014 SAR, the cost of an Air Force F-35A variant dropped $1.8 million in base-year dollars per jet; meanwhile the Marine Corps F-35B and Navy F-35C dropped by about $1 million per jet, Bogdan said. The F-35 program continues to see cost reduction due to increasing quantities and improving manufacturing costs, Bogdan said. The aircraft alone decreased by $5.7 billion, or 1.8 percent, from $324.1 billion to $318.4 billion, according to the SAR. The Pratt & Whitney F135 engine that powers the F-35 decreased $6.4 billion, or 9.5 percent, from $67 billion to $60.6 billion. The latest SAR also shows an increase of about $300 million in base-year dollars for research, development, test and evaluation, Bogdan said. However, this increase does not reflect “real” RDT&E costs, rather it shows the JPO’s transfer of funds from the procurement account to the RDT&E account, Bogdan said. This had “zero net impact” on program costs since there was a corresponding decrease in procurement funds captured in the SAR. Real RDT&E costs held steady from 2014 to 2015, he noted. Be the first to comment on "F-35 Will Fly Until 2070 — Six Years Longer Than Planned"